Edited by ruKrazy, 01 March 2014 - 11:44 PM. You need to change your account settings and set the server settings according to this link it seems they changed the access to SSL that is good because it's a more secure way to access your mail. Sorry problem has been fixed I closed outlook express then ran the attachement and it's working great... many thanks !! Edited by ruKrazy, 02 March 2014 - 12:19 PM. To backup Outlook Express manually you will need to do several steps found here another option is to use a free tool like Geni9 Outlook Express Backup. Better yet ditch Outlook Express and start using Mozilla Thunderbird Portable. 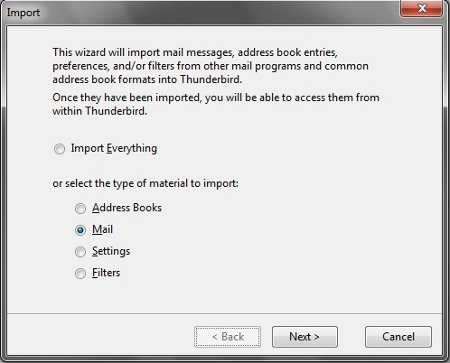 Thunderbird can import everything from Outlook Express and the portable version is self contained you only need to copy the folder where it resides to backup everything on it. The portable version can be run in any other computer from a flash drive or from a external hard disk. Does this pick up all files if I have outlook express ? Edited by ruKrazy, 02 March 2014 - 07:30 PM. Mozilla Thunderbird is an e-mail client it can do all the things Outlook Express do, but is a more secure and updated program. If you want to ditch Outlook Express you need to install Mozilla Thunderbird Portable by running the ThunderbirdPortable_24.3.0_English.paf.exe it will ask where you want to extract the program, create a folder like D:\PortableApps\ or create it in C:\PortableApps\ and point the installer to that folder, a new one will be created for Thunderbird. If I'm not mistaken a shortcut is also created on the Desktop to start the program, run Mozilla Thunderbird making sure Outlook Express is closed. At first start it will ask if you want to import everything from Outlook Express, choose what you want to import (probably everything) and after that Thunderbird should have all your e-mail and your account set you only need to check for new e-mails and enter your password. it reads incoming imap is that correct ? Edited by ruKrazy, 03 March 2014 - 11:17 AM. Did the program import your e-mails successfully? Let the program import everything.